Druid Justice Releases on February 24th! 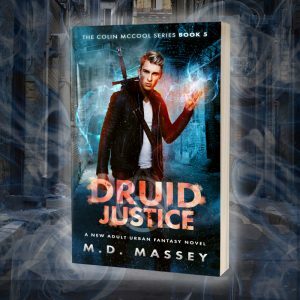 Yes, the next Colin McCool novel, Druid Justice, is releasing in two days. I am particularly excited about this bit of news, as it’s been a while since I released a Colin McCool novel. Getting the flu set me back a bit on my writing and publishing schedule, so it’s releasing a few weeks late. After Colin cuts off their connection to Underhill, the high fae lose their position of magical supremacy. Sensing a shift in the balance of power, an unknown faction begins a brutal assault on the fae. Incensed by the injustice of their actions, Colin embarks on a one-man quest to find the persons responsible… so he can mete out some Druid Justice. You can currently pre-order the book for .99 cents, but the price of the book will go up to the normal retail price of $3.99 after the initial launch. Click here to get your copy of Druid Justice! For the last few years I’ve had the Scratch Sullivan THEM series enrolled in Amazon’s KDP Select program, in order to make those books available in Kindle Unlimited. However, late last year I decided it was time to release them to a broader audience. 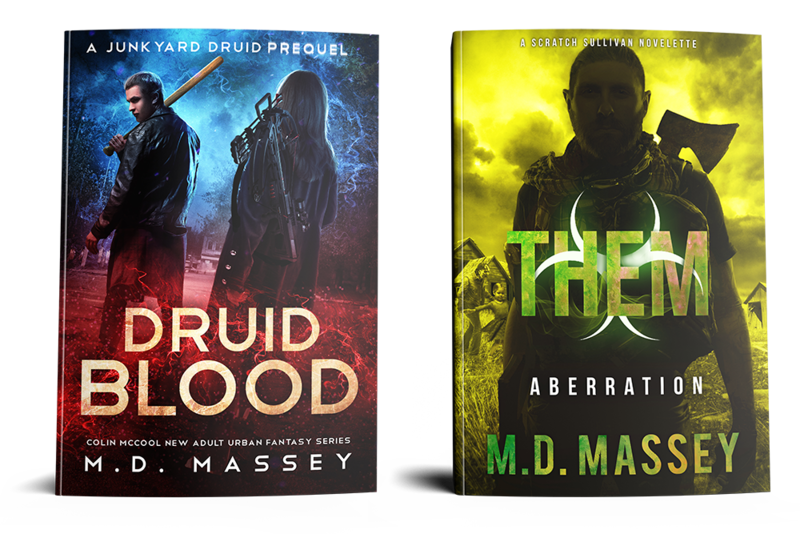 So, this month I pulled the books from KDP Select and I’ve begun uploading them to Barnes & Noble’s Nook store, the Kobo store, iTunes, and a few other random book distribution sites through Draft2Digital. Some of the books are already for sale on B&N and Kobo, and I’m updating the sales links on my “Books” page as they go live. You can check each book individually for a buy link on their individual pages, or simply visit your favorite online bookseller and search for my name or the book’s title. THEM: Total Apocalypse Box Set Releases In March! Several other authors have advised me to create a box set for my main series. Since I’ve been busy uploading the Scratch Sullivan THEM books to various booksellers, I figured I’d start by creating a box set of the first three books in that series. 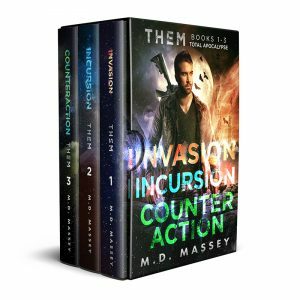 The normal price for all three books is around $9.00, and I’m pricing the box set at $6.99 for all three novels. Be advised, I will also try to run a deal on that set sometime soon—and if I can get a BookBub spot I’ll probably drop the price of the box set to .99 cents for the day of the promo. So, if you’re a real bargain hunter and you want to get the best deal on that set, wait until I get it in the BookBub newsletter before you pick it up. You’re probably wondering what comes next after Druid Justice, right? Well, the next novel on my “to be written” list is the first in a planned three-book series featuring a couple of characters from the Colin McCool universe. I’m not quite ready to let the cat out of the bag yet, but I should have a cover reveal for you folks sometime in mid-March. Granted, these dates are tentative and they are not set in stone. I’ll always update you on my Facebook page and possibly Instagram if I get behind schedule (which is likely, because the above timetable is quite ambitious). Sadly, my father-in-law passed away this last Sunday. He was a kind and decent man, and he will be missed. It’s weird, because I was writing a scene for Druid Justice just a few weeks ago, and I found myself crying like a baby as I wrote it because the emotions felt so real. Little did I know that I’d be having that exact conversation with my boy not long after. It’s amazing the things your subconscious works out when you’re not paying attention. Spend time with your loved ones, people. Life is fleeting and fragile, and in an instant you can be left wondering where it all went. That’s all for now. I’ve been working 10-12 hour days for the last several weeks, finishing up Druid Justice and getting all the Scratch Sullivan titles uploaded to other booksellers. So, I think I’ll go have a glass of whiskey now and maybe grab a new video game to binge on. Stay frosty, people.